This article first appeared in the souvenir program of the 2012 Philippine International Guitar and Competition sans my name. In the Philippines, and perhaps, elsewhere in the world, there are more people who want to learn to play classical guitar than those who actually are playing it right. Two of the possible reasons for this are the lack of access to teachers and teaching materials, and of course, community of guitar players who could encourage and enrich each other. The Guitar Friends (GF), a group of guitar aficionados of varying levels of expertise in guitar performance brought together by their love for guitar and their association with Maestro Jose Valdez, tries to fill the need for a community of guitar enthusiasts. GF intends to gather guitar players, young and old, advanced and beginners, into one group and provide them with avenues and opportunities to share their knowledge, skill, understanding, and appreciation of the classical guitar and its music. For this reason, FG organizes special events such as concerts, competitions, workshops, and this much anticipated yearly event, the International Guitar Festival, held in the last week of January. The Festival is no doubt the highlight of GF’s activities. It is sponsored by big prestige corporations such as Mercedez-Benz, Petron Corporation, Smart Communications, Inc., San Miguel Corporations, Pagcor, Pacific Online Lotto, and many other companies. It is also sponsored by the world’s famous guitar makers such as Yuichi Imai, Casa de la Guitarra S.A., and Milagro. And by the Cultural Center of the Philippines (CCP), Instituto Cervantes, and the Spanish Embassy. Where else in the Philippines can you find a gathering of guitar aficionados from around the world but during the festival? You see people from all walks of life fall in line in the ticket booth for the concerts and lectures, or just hanging around in awe of the world class guitars on display in the halls of CCP. Of course, there are also books, guitar accessories, and souvenir items. In the first Philippine International Guitar Festival in 2010, three of the Philippines’ finest classical guitarists abroad went back home to participate: Florante Aguilar, one of the leading proponents of Philippine harana music in America today; Michael Dadap, artistic and music director and conductor of The Children’s Orchestra Society of New York City since 1984; and Perfecto De Castro, former Pinoy Rock supergroup Rivermaya guitarist, who is now based in Southern California and performs music on his 10-string classical guitar. The only foreigner was the Taiwan-born, US-educated, Steve Lin, who has had concerts from around the world. He was also the first prize winner at the 2006 Boston Guitar Fest Competition and the 2001 East Carolina University Guitar Competition. 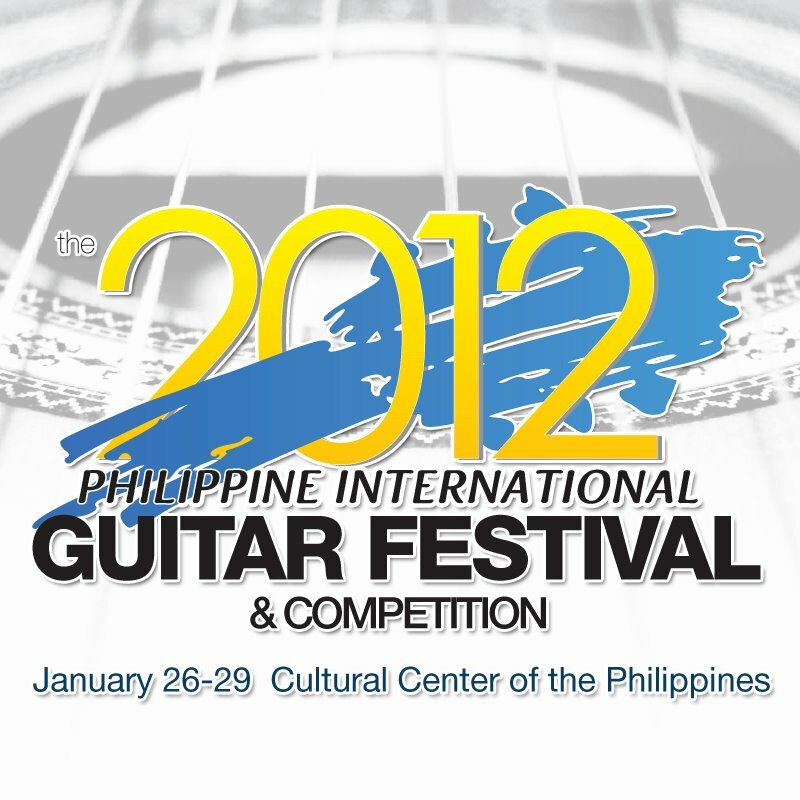 His status as the only non-Filipino in the festival was to change in the 2nd International Guitar Festival and Competition. From the Philippines, there were Maestro Jose Valdez, ranked as one of the early exponents of the guitar by the CCP Encyclopedia of Arts, pioneer of guitar courses in several schools, and author of numerous books on the subject; Sixto “Butch” Roxas, a rock and jazz musician who has gone to America, France, and Spain to study music and is now re-establishing and playing for the UST Jazz Orchestra; Lyndon Aguilar, a Bachelor of Music and Master of Arts in Music Theory from UST Conservatory of Music and a faculty of UST Jazz Studies Department and teaches Jazz Harmony and Jazz Theory. Also from the Philippines, were conductors Josefino Toledo, a Ten Outstanding Young Men (TOYM) awardee and an International Award for the Arts recipient; and Arturo Molina, Jr., who is also a violinist and the first foreign student in Moscow to win the annual String Department Competition. The following were the group participants during the first festival: The Manila Symphony Orchestra, The Tabs Trio composed of Lester Demetillo, Armando “Tabo” Derecho and Jerry Duran; the Kasilag Guitar Trio composed of Benchito Cariño, Edgardo de Dios and Phil Valdez; the Oktokanto, a group of guitar majors of the University of the Philippines’ College of Music in Diliman, Quezon City, the UP Guitar Orchestra, the St. Scholastica’s College Guitar Orchestra (SSC), the PWU Guitar Ensemble, the Paulinian Guitar Ensemble, the Sta. Isabel Guitar Quartet, the Angelis Guitar Quartet composed of four young ladies all enrolled at the Yamaha School of Music, The Quezon City Performing Arts Development Foundation. The individual participants were Franco Maigue, the First Prize winner of the 2004 Metro Manila Community Orchestra Concerto Competition and top prize winner of the 2002 and 2009 National Music Competition for Young Artists (NAMCYA); Monching Carpio, a finalist both in the 2005 National Music Competition for Young Artists (NAMCYA) Guitar Category C, and 2009 Asia International Guitar Competition in Bangkok, Thailand and 2nd prize winner in the 2009 NAMCYA. Mr. Carpio would win the top prize in the guitar first guitar completion of the Festival; and Carlo Juan who was awarded the Honorable Mention in the 2009 National Music Competition for Young Artists. The 2nd Festival in 2011 had to be better, of course. So, to the roster of foreign teachers and performers were added Woratep Rattanan-umpawan from Thailand, Leon Koudelak from Czech Republic, Andreas Kapsalis from Greece and USA, Neris Gonzales from Argentina and Spain, Alex Garrobe from Spain, and Carsten Linck from Germany, and the pioneer of the first festival, Steve Lin from Taiwan and USA. Mr. Rattanan-umpawan won First Prize in the Yamaha Guitar Festival Competition in Bangkok for three consecutive years (1985-1987). He has recorded two albums (Guitar Lai Thai I, II), and has performed around the world. He now teaches at the Chulalongkorn, Mahidol, and Silpakorn Universities and also at the Thailand Guitar Society. Leon Koudelak from the Czech Republic, winner of the “Fundacion Jacinto de Inocencio Guerrero” competition in Madrid, was awarded the Appreciation Prize from the Austrian Federal Ministry for science and research. He has studied in Europe and performed in all the continents of the world except Australia and Africa. In 2008, his live performance in Seoul was released by the Thailand Guitar Society. He is the artistic director for the Liechtenstein Guitar days LiGiTa, an important music event in Europe, and Asia International Guitar Festival in Bangkok, the largest festival in Asia. He teaches at the Mahidol and Silpakorn Universities in Thailand, as well as in the Thailand Guitar Society. Andreas Kapsalis from Greece, is perhaps the only musician you will see playing the guitar like a piano. He lays the guitar on his lap and taps the strings with his eight fingers. He met an accident that severed his tendon in a finger when he was eighteen. He rocked the concert hall during his performance. He has released an album in June 2004. Neris Gonzales from Argentina and Spain started learning classical guitar when he was 11 years old. He has a degree in Jazz Guitar Music from Escuela de Musica Popular de Avellanada in Argentina after studying with renowned masters in Tango, Jazz and Folk Music. He moved to USA in 2000 and performed with artist such as Lauren Hill, Ricardo Montaner, Al Dimeola, Valeria Hynch as well as with several Tango Orchestras, Blues and Latin Music bands. He designs and makes unique guitars with his own label “Bartolex”, specializing on unique classical guitars. In 2010 he created the “Milagro Concert Series” to provide the finest concert guitars. Alex Garrobe was in Barcelona into a family of musical tradition. He graduated with First Class Honours from Alicante Conservatory in 1988. In 1990 he was awarded the Alexander von Humboldt Foundation Scholarship to broaden his studies at the Musikhochschule in Cologne with Hubert Käppel. Some of the most important influences for him were his teachers José Tomás, William Watters, Carles Trepat, and Josep Pons. Carlsten Linck, from Germany, has his focus on chamber music with special emphasis on song accompaniment. More than once he has been a laureate of Jugend musiziert, Germany’s national award for young musicians, and first prize winner at the Internationaler Bubenreuther Musikwettbewerb. For his artistic works, he received the culture award fo the city of Essen in 1992. He plays the 6 string guitar as well as the 11 string alto guitar made by George Bolin. The guitar craftsmen also came along. There was Yuichi Imai and Ichizo Kobayashi from Japan, Pansaeng Chantarangkul from Thailand, and Tabo Derecho from the Philippines. Yuichi Imai, born in 1949, decided to become a guitar maker when he was 18. He studied under Master Teruaki Nakade, and established his own studio in 1971. He started exporting to America, Europe and Asia in 1975. To own one of his guitars, you will have to be in a long waiting list. Ichizo Kobayashi, born in 1956, learned the art of guitar making in 1978 at the Yukinobu Chai Guitar Worshop. He established his own shop in 2000. His guitars are among those loved by concert guitarists. Thai Luthier, Pansaeng Chantarangkul, was raised by his grandparents. His grandfather was a carpenter, and from a young age, he began toying with wood. He went to school and later worked in a factory until he decided to make guitar. He learned from a local luthier, and then he went to Japan for three weeks to observe the world renowned guitar maker Yuichi Imai. Three weeks was the time it took to finish one guitar. Since then, he has been making and selling guitars at an average of 20 guitars per year. Filipino luthier Armando Derecho learned guitar making in the 80’s after he obtained his Business Management degree from the University of San Carlos in Cebu City, and after studying music at the University of the Philippines under Joey Diola and Lester Demetillo. He set up his shop in 2000 with his assistant Narding Ompad, a respected guitar maker also from Cebu. Today, Derecho Guitars are earning the respect of serious guitar players both in the Philippines and around the world. Among the Filipino classical guitar players based abroad, only Michael Dadap returned for the second Festival. But the local greats were present: Jose Valdez and Butch Roxas. Lester Demetillo of UP and Ruben Reyes of UST came back as conductors with Jeffrey Solares. Majority of the group who participated during the first Festival was back in the second, except the Manila Symphony Orchestra, the Tabs Trio, and the Paulinian Guitar Ensemble. Two new groups however took their places: the Christian Arts Guitar Quartet, a group composed of Christian Music College instructors Ranilo Gadapan and Paul Rivera, and the Greenhills Music Studio Suzuki Guitar Ensemble. The logical addition to the 2nd Festival that surely made it a hit was the competition. Of the twenty four (24) participants from Indonesia, Singapore, Thailand, Japan, and the Philippines, eight (8) were chosen for the finals: four Thais: Pattomavat Thammachard, Hitoshi Miyashita, Tanish Saengwichai, and Kornpol Mitrevej; three Filiponos: Ramoncito Carpio, Arthur Erskine Basilio, and Franco Raymundo Maigue; and a Japanese, Takashi Endo. Filipino Ramoncito Carpio garnered the top prize award and received a Yuichi Imai model guitar, a trophy, a cash award of $800, concert engagements in the Philippines and in Thailand, Kyser Musical Products, Aranjuez String Sets, and other merchandize. Thai guitarist Hitoshi Miyashita won 2nd prize and he received a Ichizo Kobayashi Guitar, cash gift of P25,000 ($580), Trophy, Kyser Musical Products, String sets from Aranjuez and other merchandise, while Japanese guitarist Takashi Endo placed 3rd and received the following prizes: Milagro Guitar JP1 Model, Cash gift of P15,000 ($345), trophy, Kyser Musical Products, string sets from Aranjuez, and other merchandise. Meanwhile, Arthur Erskine Basilio was named Best Filipino guitarist. For his prize, he received an Armando Derecho Guitar, cash gift of P10,000.00, trophy, Kyser Musical Products, string sets from Aranjuez, and other merchandise. The competition was judged by a distinguished panel of luthiers (from Japan, Yuichi Imai) and concert guitarists from the Czech Republic (Leon Koudelak), Germany (Carsten Linck), Taiwan/USA (Steve Lin), Thailand (Woratep Rattana-umpawan), Japan (Tomonori Arai), Jose Valdez (Philippines), and Michael Dadap (Philippines/USA). This entry was tagged 2012 Philippine International Guitar Festival and Competition, Armando Derecho, Butch Roxas, Carsten Linck, Christian Arts Guitar Quartet, Christian Music College, Greenhills Music Studio Suzuki Guitar Ensemble, Hitoshi Miyashita, Ichizo Kobayashi, Jeffrey Solares, Joey Diola, Jose Valdez, Leon Koudelak, Lester Demetillo, Manila Symphony Orchestra, Michael Dadap, Milagro Guitar, Narding Ompad, Pansaeng Chantarangkul, Paul Rivera, Paulinian Guitar Ensemble, Ramoncito Carpio, Ranilo Gadapan, Ruben Reyes, Steve Lin, Takashi Endo, the Tabs Trio, Tomonori Arai, Woratep Rattana-umpawan, Yuichi Imai. Bookmark the permalink. Hello, Dody. Am sorry for the late reply. We don’t have a guitar festival for 2013. Hello everyone, Can anybody help me find out who we can contact for more information regards to the guitar festival competition. I have tried sending e-mail to few people but didn’t recieved any reply.